Today I'm checking out Bay Street Brown Ale by Sleeping Giant Brewing out of Thunder Bay, Ontario. 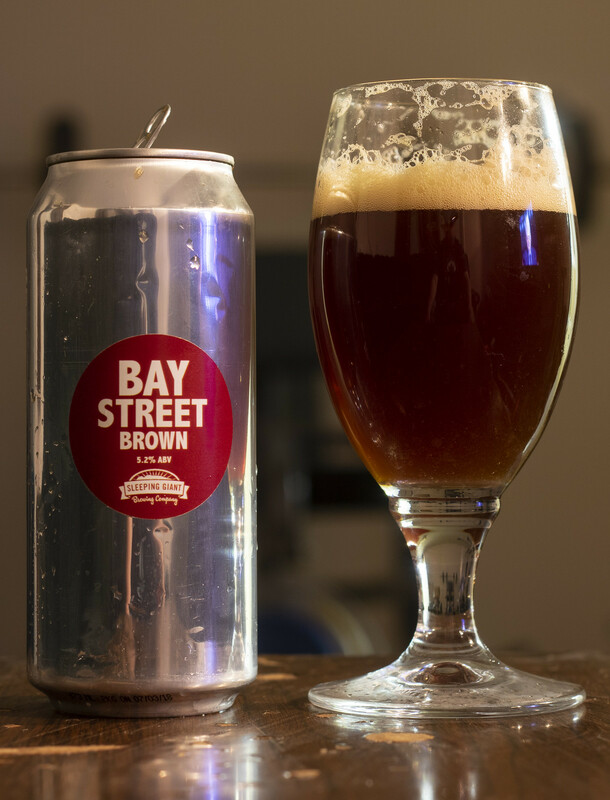 Bay Street Brown is Sleeping Giant's take on your classic Brown Ale. The beer was first released back in 2014, but it appears that it's a seasonal offering by the brewery as you can tell that they used a sticker for the label on the can. Appearance: FFS... this is a gusher, I pour a good deal of beer into the glass and it comes out with a lot of beige foam, and the glass is at capacity with foam but the can is gushing out more and more foam. 10-15 minutes later, after cleaning up a lot of foam, the beer looks somewhat presentable. The body of the beer is a murky brown ale with a hint of cherrywood red hue to it. Once the foam dies down (finally), there's a light quarter finger's worth of head on top of the beer and a light amount of lacing on the glass.. I expected more lacing from all the gushing but I guess not. Aroma: Toasted malt profile to give off a bit of a caramel and nutty smell to the beer, a bit of soapiness (Dove). Light amount of dark fruit notes (raisin/figs) and an earthy hop presence as well. Taste: For a gusher of a beer, I was expecting this beer to be a write-off but this one tastes like your classic Brown Ale - it's sweet with a caramel malt profile, as well as a light amount of a nuttiness to it. There's a light earthiness from the malt/hops to give it a bit of a bitterness to it. Not harsh on the palate, has a bit of a bitter aftertaste but diminishes almost immediately. Overall Thoughts: This beer is quite reminiscent of the typical Amber Ale/Brown Ale you saw craft breweries making a decade ago.. but it's not a style you see much of anymore. This is sweet and a bit nutty, not overly complex but something that fits in well on a -35C kind of night like tonight. my shirt's soaked because of the gushing but it turned out be a decent Brown Ale.